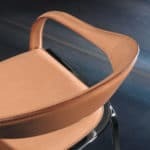 With only one backrest, this Fettuccini chair is more discreet but just as elegant as its counterpart. With only one backrest, this Fettucini chair is more discreet but just as elegant as its counterpart. A must-have for all those who are passionate about design ! Vision chair in teak and stainless steel with marine rubber membrane for a totally modern look.